Announcement Welcome, I’m Beth Hill! I love creating custom cartoon portraits and illustrations inspired by nature and a love for the landscape here in Devon. Welcome, I’m Beth Hill! 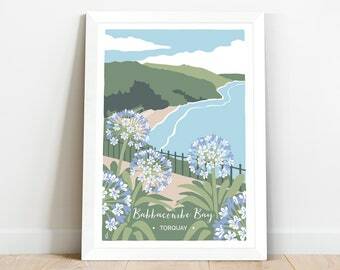 I love creating custom cartoon portraits and illustrations inspired by nature and a love for the landscape here in Devon. We love our picture! Beth is super talented and very patient as we wanted the 100 balloon version printed in a1 size. She was able to accommodate all of our requests and the picture arrived earlier than expected and better than we could have hoped! We can’t wait for everyone to see it on our wedding day. Thanks Beth!!! 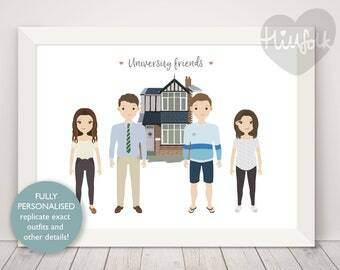 second time ordering these illustrations, we love them! Beth was also super great in making tweaks and adjustments. thank you so much and looking forward to ordering more in the future! ️New listing ️ Include your family home or another memorable building in your custom portrait! 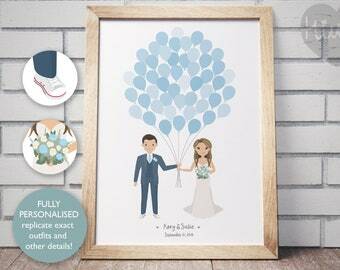 Excited to share my latest listing - a custom wedding portrait with balloons. 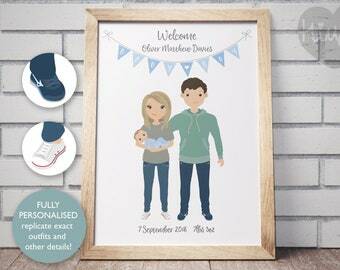 It makes a cute alternative guest book and a wonderful keepsake from your special day! My illustrations usually start as 5 minute thumbnail sketches like these. Sometimes I work up my ideas on my iPad, then move onto my Mac to create the final piece. 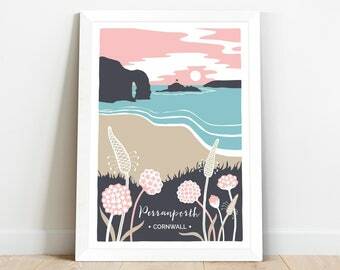 Prints are available framed or unframed, in a range of sizes. I’m also looking into other products - watch this space! Custom portraits are such fun! They work best if they include lots of little details unique to you. 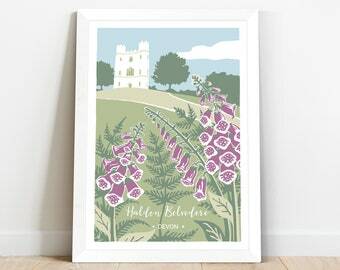 Illustrations inspired by nature and my love of the local landscape here in Devon, plus custom cartoon portraits capturing all your unique details. 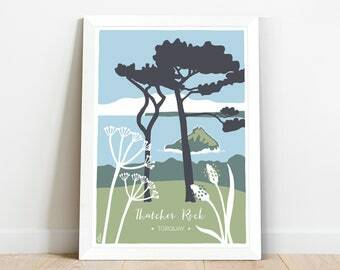 Hi I'm Beth Hill, artist and owner of Hillfolk Illustration. I always wanted to make a living doing something creative, and initially studied Fine Art at uni, before training as an Art teacher and eventually settling into a career as a graphic designer 17 years ago. I now work part time as the lead creative for a local authority. 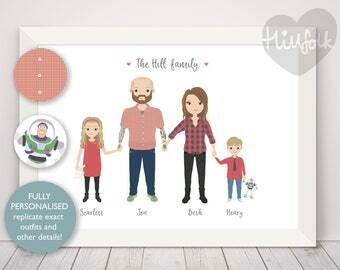 I set up Hillfolk in 2015 after creating a portrait for my mum of all her grandchildren, replicating their exact outfits and adding little details such as a favourite teddy or comforter. I was already doing bits and bobs of freelance design to supplement my day job, but realised illustration might be a much more rewarding way to both satisfy my creative needs and make a bit of money at the same time! Since then I have developed my style to make my portraits even more customised and added a range of prints aimed at big and little kids too. 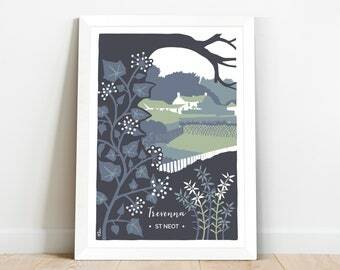 Last year I decided to go back to my artistic roots and started to build a collection of illustrations, depicting the natural environment in some of my favourite places here in Devon. It was quite a big move for me, as I have never really felt confident enough to sell my art. However, I’ve been touched by how well it has been received, which has in turn spurred me on to come up with more ideas for places to depict. 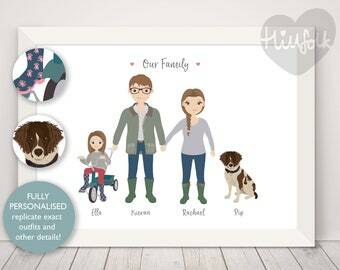 I'm always happy to customise any of my prints, should a customer require something in particular. I hope you like my work - I love creating it! This company prints my illustrations for me. I only hold personal information (name and contact details) for the purposes of accounting, processing an order or if you have asked me to add you to my mailing list. Online payments are processed by Etsy and Paypal who hold your data securely. I will not sell, distribute or lease your personal information to third parties unless I have your permission or are required by law to do so. You may request details of personal information which I hold about you and you may ask for them to be deleted. If you would like a copy of the information held on you, please complete the contact form above. Data Protection / GDPR privacy notice: I only hold personal information (name and contact details) for the purposes of accounting, processing an order or if you have asked me to add you to my mailing list. Online payments are processed by Etsy and Paypal who hold your data securely. I will not sell, distribute or lease your personal information to third parties unless I have your permission or are required by law to do so. You may request details of personal information which I hold about you and you may ask for them to be deleted. If you would like a copy of the information held on you, please complete the contact form above. I would like to order a custom portrait, how long will it take? Please check my shop announcement for current turnaround times. This timescale is for a first draft, so please factor in time for any amendments, printing, framing and postage. What information will you need to produce a custom portrait? Please fill out the personalisation box with as much info as you can. I've also written a blog post called '5 ways to make your Hillfolk custom portrait awesome' which has a few tips for getting the most out of your experience. 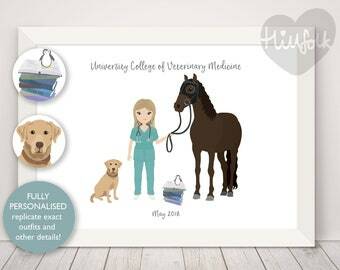 I would like to personalise one of your prints - is this possible? Yes, certainly! If you would like to change / add some text to a print, or have it in a different colour please get in touch with me before purchasing and I will be happy to help. What frames do you offer? There are two options for frames: a readymade frame in A4 or A3 sizes with a 20mm moulding in black or white wood finish, or a superior custom made frame with an internal mount, in a wide range of finishes. All frames use styrene instead of glass, which safer to deliver as it doesn't crack or break in transit. All my frames are produced by an award winning Fine Art framer in the UK, the quality of their work is really amazing! What paper / ink do you use? 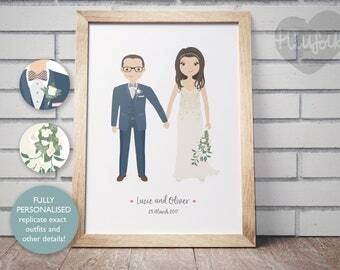 All my illustrations are produced as giclee art prints on archival quality 230gsm matt paper. This paper is perfect for reproducing strong, vivid colours and guarantees a pleasing and high quality appearance that is reliable and long lasting, even under extreme conditions.